MACDONELL (Collachie), ANGUS, office holder, lawyer, and politician; b. in Inverness-shire, Scotland, son of Allan McDonell of Collachie and Helen MacNab; d. unmarried 7 or 8 Oct. 1804 in the wreck of the Speedy on Lake Ontario. In 1773 the Collachie family was part of an emigration of about 600 Highlanders from the lands of the Clan MacDonell of Glengarry to Sir William Johnson*’s estate in the Mohawk valley of New York. After the outbreak of the American revolution the Highlanders remained loyal to the crown and in January 1776 Major-General Philip John Schuyler took Allan McDonell and five other leaders hostage to ensure the neutrality of Sir John Johnson* and his Highland tenants. Fearing arrest by the rebels, Johnson struck out for Montreal, Que., early in the summer with about 130 Highlanders and 120 others. Old Collachie escaped in May 1779 and by August he had reached the province of Quebec where he resided, first at Yamachiche and then at Quebec, until his death in 1792. Unlike his brother Alexander*, Angus Macdonell does not seem to have served in a loyalist corps during the revolution. Nor was he living with his father at Quebec at the end of the war. He did, however, spend a few years about this time in Montreal and Quebec where he gained a seminary education and acquired a sound grasp of the French language. In June 1785 he was at Quebec where he had been jailed for debt. After his release Macdonell began experimenting with a new method of manufacturing pot and pearl ash and in November 1788 he applied for a patent. In April 1791 the province of Quebec passed an act which granted exclusive patent privileges to him, his brothers James and Alexander, and Christopher Carter, as well as to Samuel Hopkins, a rival inventor who also had devised an improved process. That same year Macdonell and Hopkins became partners and attempted, it appears, to market their product. 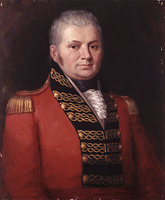 The Collachie family’s proven loyalty and young Macdonell’s ability as a chemist apparently came to the attention of the lieutenant governor of Upper Canada, John Graves Simcoe. Informed by the Lower Canadian deputy surveyor general, John Collins*, of salt springs in Upper Canada, in 1792 Simcoe commissioned Macdonell and William Chewett* to explore the area around the Bay of Quinte and the Niagara peninsula for sites and to analyse their quality. 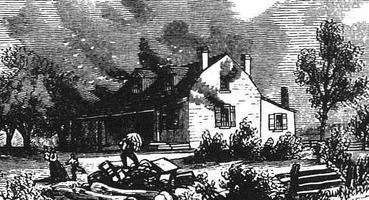 Macdonell reported a major location on the Fifteen Mile Creek in the Niagara region and Simcoe immediately set him to work establishing a project to produce salt there for general consumption. Delays occurred in securing supplies and provisioning labourers but Macdonell, now superintendent of the works, plunged ahead, spending large sums. After three years in operation the project had produced a disappointing 450 barrels. Having declared that he was “determined to stand or fall” by the works, Macdonell was removed in 1796 and replaced by the local Church of England clergyman, Robert Addison*. Macdonell’s other government duties, it seems, had prevented him from providing effective management. As first clerk of the House of Assembly – he had been appointed on 12 Dec. 1792 – Macdonell administered the oaths to members, recorded the business of the house, and provided for the printing of its journals and statutes. 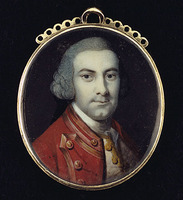 In spite of frequent tardiness in performing his duties, which exasperated Simcoe’s secretary, Edward Baker Littlehales, on 29 Oct. 1794 the lieutenant governor named Macdonell secretary to the Upper Canadian commissioners – Richard Cartwright, John McDonell (Aberchalder), and John Munro* – who had been appointed to negotiate a revenue-sharing agreement about customs duties with their Lower Canadian counterparts. 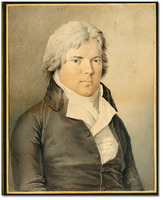 Late 1798 saw the arrival at York (Toronto) of French royalist émigrés, led by Joseph-Geneviève Puisaye*, Comte de Puisaye, who were on their way to establish a military settlement at Windham, a few miles north of York. In 1799 Administrator Peter Russell made Macdonell his French secretary, instructing him to act as the settlement’s agent. It appears that Macdonell exceeded his authority, and charges were laid against him by Puisaye. 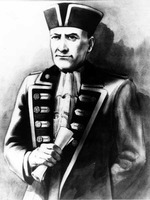 The Executive Council examined the matter in September 1800 and determined that Macdonell had engaged in unauthorized transactions in Indian land. It concluded that “he is unworthy of any favour from the Executive Government and unfit to hold any situation under it,” and Macdonell was dismissed as clerk on 30 May 1801. He petitioned the assembly, which passed a resolution stating that he had not been dismissed for any irregularity in his conduct as clerk and which awarded him £300, this being the salary unpaid for two years. During his brief years in the assembly, Macdonell was among its most energetic, productive, able, and independent members. He initiated legislation, not always successfully, to encourage the cultivation and export of hemp, to better secure land title, to establish a Court of Chancery, and to reform the fee schedules of attorneys. He was responsible for the Assessment Act of 1803 which attempted to provide more equal rates. He championed the rights and prerogatives of the assembly and in 1803 he attained a degree of notoriety for his effort to have David Burns, clerk of the crown and pleas, held in contempt of parliament for his attempt to avoid questioning on the matter of fee schedules, a favourite target of Macdonell’s. His most frequent associates in the assembly were David McGregor Rogers*, Ralfe Clench*, and Robert Nelles*. One of the most important facets of Macdonell’s career – his legal practice – is the least known. 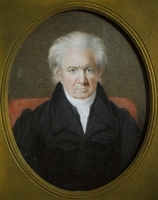 A prominent York lawyer, he was admitted as an attorney on 7 July 1794 and became a barrister in Trinity term 1797. He was a founding member of the Law Society of Upper Canada and succeeded Robert Isaac Dey Gray as treasurer in Easter Term 1801. In October 1804, on his way to defend an Indian charged with murder, Macdonell perished with Gray when the schooner Speedy sank in a gale off Brighton. Angus Macdonell died a freemason without a strong attachment to the Catholic Church of his forefathers. An unaccomplished poet, he had distinct ability in law and politics, which was undermined by his procrastination, irascibility, and occasional indolence. AO, ms 517; MU 1776–78; RG 22, ser.155, will of Angus Macdonell. BL, Add. mss 8075, 104: 1–120 (transcript at PAC). PAC, MG 24, I8; RG 1, E3; RG 5, A1: 330–32, 707–9, 1202–4. “Accounts of receiver-general of U.C.,” AO Report, 1914: 754. Corr. of Lieut. Governor Simcoe (Cruikshank). “Journals of Legislative Assembly of U.C.,” AO Report, 1909. [Alexander Macdonell], “A journal by Sheriff Alexander Macdonell,” J. E. Middleton and Fred Landon, The province of Ontario: a history, 1615–1927 (5v., Toronto, [1927–28]), 2: 1246–50. “Ordinances made for the province of Quebec by the governor and Council of the said province, from 1768 until 1791 . . . ,” PAC Report, 1914–15, app.C: 254–55. “State papers,” PAC Report, 1890: 281. “State papers – Upper Canada,” PAC Report, 1891: 100, 128, 137, 158, 162. Town of York, 1793–1815 (Firth), 163–64, 170–77, 226–29, 234, 239, 250. [Joseph Willcocks], “The diary of Joseph Willcocks from Dec. 1, 1799, to Feb. 1, 1803,” J. E. Middleton and Fred Landon, The province of Ontario: a history, 1615–1927, 2: 1250–322. Quebec Gazette, May–July 1791. York Gazette, 2 May 1804; 4, 11 July 1807. Dooner, Catholic pioneers in U. C., 1–34. Riddell, Legal profession in U.C. J. R. Robertson, The history of free masonry in Canada from its introduction in 1749 . . . (2v., Toronto, 1899). Henry Scadding, Toronto of old, ed. F. H. Armstrong (Toronto, 1966). Ernest Green, “The search for salt in Upper Canada,” OH, 26 (1930): 406–31. H. H. Guest, “Upper Canada’s first political party,” OH, 54 (1962): 275–96. W. R. Ridden, “The legislature of Upper Canada and contempt: drastic measures of early provincial parliaments with critics,” OH, 22 (1925): 187–91. W. L. Scott, “The Macdonells of Leek, Collachie and Aberchalder,” CCHA Report, 2 (1934–35): 22–32; “A.U.E. Loyalist family,” OH, 32 (1937): 140–70. Allan J. MacDonald, “MACDONELL, ANGUS (Collachie),” in Dictionary of Canadian Biography, vol. 5, University of Toronto/Université Laval, 2003–, accessed April 19, 2019, http://www.biographi.ca/en/bio/macdonell_angus_5E.html.